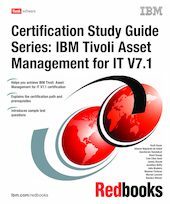 This IBM® Redbooks® publication is a study guide for IBM Tivoli® Asset Management for IT V7.1 and is aimed at individuals who want to get an IBM Professional Certification for this product. The IBM Tivoli Asset Management for IT V7.1 certification exam, offered through the Professional Certification Program from IBM, is designed to validate the skills required of technical professionals who work in the implementation of the IBM Tivoli Asset Management for IT V7.1 product. For your convenience, we structure the chapters based on the sections of the Test 000-016: IBM Tivoli Asset Management for IT V7.1 Implementation, such as Assets, Inventory, and so on, so studying each chapter will help you prepare for one section of the exam. Note that Test 000-017: Foundations of Tivoli Process Automation Engine is a prerequisite for IBM Certified Deployment Professional - IBM Tivoli Asset Management for IT V7.1 certification. To prepare for that test, refer to the IBM Redbooks publication "Certification Study Guide Series: Foundations of Tivoli Process Automation Engine", SG24-7763.